iMonitor EAM is an easy-to-use surveillance software that provides total employee monitoring solution to enterprises at any size - from large ones to SMES. The solution enables organizations to record every employee’s computer activities, include keystrokes, clipboard activities, screen shots, file documents(copy, move, paste, delete, rename, create), print jobs, E-mail, web-mail (GMail, Yahoo mail, Hotmail and all other popular web-mail), on-line storage usage, FTP file transfer, websites, searches, file downloads, program usage and time, Skype, QQ, ICQ, AIM, Google talk chat, Facebook, Twitter activities, removable storage usage, application network traffic, system events and so on. iMonitorSoft is a software development company that delivers sate of the art productivity enhancement solutions. It provides the monitoring software for business, Government, education etc. to monitor all the activities of employees in any organization. iMonitor EAM provides unmatched visibility in the online communication activities of employees and contractors. iMonitor EAM is the system of record.Presenting detailed, accurate, and actionable data for incident response, high-risk insider monitoring, and productivity reporting, record every employee computer activities. All events in one solution, iMonitor EAM aims to maximize the value of every employee and to improve their productivity. To understand exactly how your devices are being used with iMonitor reports. With productivity reports and activity log, every action taken on your devices will be recorded and sorted. These will give administrators valuable insights on what their employees are doing, how they are doing it, where they’re spending time, what type of work they’re working on, and much more. iMonitor EAM provides remote function.It can monitor target computer activities remotely. The most powerful is that with live desktop, you can view the desktop of each employee's computer, even you can open the camera remotely in real time on the employee's computer to view their work scene. iMonitor EAM can collect the generally online and local reports and it can be saved daily, weekly, monthly. Analyzing employees' computers and internet activity based on stamps, frequency or keywords, and displaying in charts to help you get the knowledge of employees' productivity intuitively. Blocking can let iMonitor EAM deny or permit access to any website you specify from ever being launched or set time sections during which the website is disallowed. Any unwanted program also can be blocked on a schedule or permanently, as well as determine how long the program can be used per day. And customer can block out any of the major applications. Disable removable devices (USB stick, floppy drive, smart media, memory stick, memory stick pro, secure digital, multimedia card) to protect confidential data. iMonitor EAM is the leader of data security software. You will be able to view and block sensitive data from email sending and receiving, web forms and removable media as well as data saved on local drives (even remote laptops).You can easily customize the policies via a wizard based on the user, computer or type of data. Recording e-mails sending and receiving by employees on their computers. And all the mail details, like contents, time, subjects and attachments are all recorded for later viewing. EAM starts capturing continuous screenshots when user launches web-based mail, giving you actual pictures of the email. Detecting preset keywords from keystrokes, clipboard contents, window title, document path, print job name and website title. Along with recording the time stamp, action, caption and content, a screenshot will also be taken and the instant notification will be sent to the manager's side immediately whenever keyword captures. The installation package will be downloaded instantly from the web and it will be extracted and run in minutes with no hardware required. Very easy to try, buy, install, and manage. Installation is just a few mouse clicks. 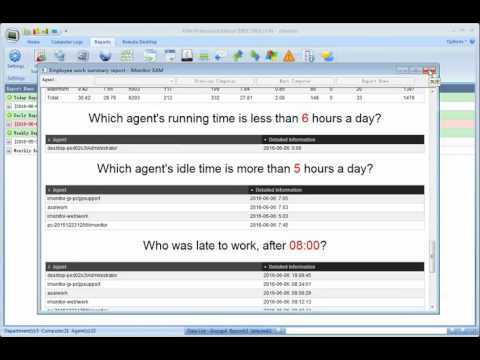 iMonitor EAM - Computer and employee monitoring software demo video. Q. What license size do I need to buy? iMonitor EAM license size is based on the number of the computer you are going to monitor, i.e. the number of computers which you install Agent in your organization. You will not be able to monitor more computers than the license size as you purchase, and each EAM agent license can monitor one Windows/Mac computer or an user session on Windows Terminal Server/Citrix. For example if you want to monitor 25 computers, you need to purchase the "25 agent license", and we will provide one monitor license for free. If you want more monitor license, then need to purchase additional monitor license. Q. Can I move EAM licenses to other client computers? Yes, If one computer breaks down and you need to put it out of commission and replace it with another computer, the licenses can be transferred over. You just need to delete the broken one, and install agent on the new one. Q. Can I install the software via flash drive? or must download directly on computer? You can copy the agent installer on a flash drive and insert it to the target computer to install. Q. Can you let me know about Stealth Mode? The agent program will work in totally stealth mode, no pop-up windows, no item in Add/Remove Programs, not item in windows start up menu, and can not be ended by the user. Q. Can I install EAM client program remotely on all the clients at one time? Yes you can, EAM supports remotely install the windows agent program. Firstly please choose Agent section on your console, after install window pop up, EAM will scan the computers what in the same network with your server computer. Then please choose the one(s) you want to install, click remotely install, the installation will be automatically done.